Rabab J Ghadiali is an Award Winning Life Coach and Educationist who is a trendsetter not only on a professional level but also at a societal level. 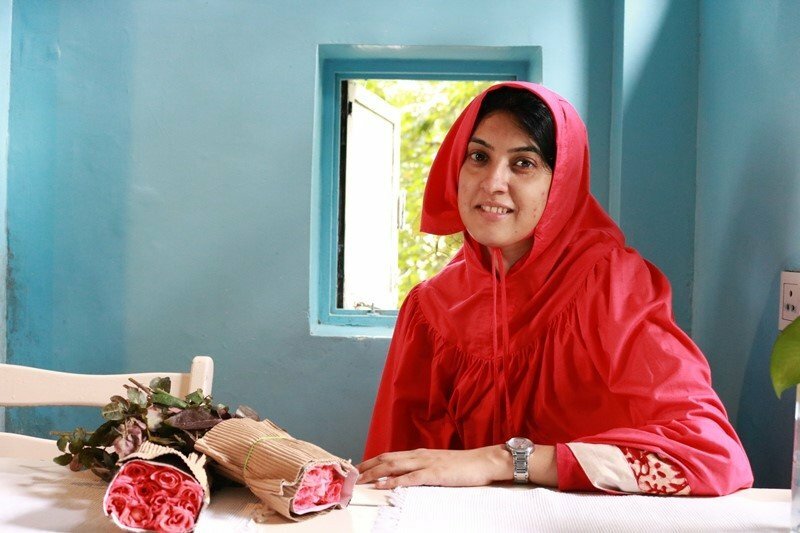 One of the very few Muslim Women Entrepreneurs who is breaking the glass ceiling, setting an example and inspiring the women in her community to become independent and empowered. She is a corporate trainer par excellence and has been balancing her family life as well as her entrepreneurial life with strength, integrity, and self-confidence. Rabab Life Coaching and Counselling, Rabab’s company was an idea that came to her while interacting with some of her friends. In a small get-together, they were discussing how for a woman life after marriage and especially motherhood revolves only around the family. This triggered a question in her mind “What is my life’s purpose?” Is it just to be a wife, mother and daughter-in-law?” She was sure there was something more to it and went on a path of self-discovery about her purpose, which ultimately culminated into her sharing her journey and becoming a Life Coach. Life was not always that good for her. Her childhood was tough as she was raised in a middle-class strict family where every expense in the house was accounted for. She would have to help her mother with daily chores after coming from school, leaving little time to study, let alone hanging out with friends. Her father was her biggest support system in her early years and always encourage her. However, her father died at a very young age which led to her being a very shy and reserved person. She was low on self-esteem and confidence. Also, to lessen the burden financially on her family she started taking up various jobs at a young age. This, in a way, was a blessing in disguise as she travelled to various places, met different people and it helped her to become more sensitive to people’s needs and struggles. Although she got married at 18 years, she got tremendous support from her husband and mother-in-law both, who encouraged her and motivated her. • Conducted 110+ private coaching sessions for individuals and 10 workshop- based group sessions. • Started the Network82 Initiative which is a networking event for women entrepreneurs. But all this hasn’t been without a fair share of challenges and obstacles. One of her major challenges was the hesitation of people watching her conducting her training in a Ridah. But she strongly believes that it’s her content and not her attire that should be the parameter to measure her work. This belief has helped her in changing people’s perceptions and apprehensions towards both the dignified traditional garment and herself. Rabab also believes in the importance of providing a secure environment for children. As part of this initiative, she conducts several training sessions to help students deal with issues like exam anxiety, studying better etc. She also helps teachers and schools to improve their study methods and teach better. A very common question she faces is that she seems to be spreading in various sectors including corporate training, teacher training and parenting and might be considered as a generalist rather than a specialist. Well it may appear so on the surface, but deep down all her training is based on the core beliefs and belief systems an individual lives with. If a child believes that he is not good in Maths, or an entrepreneur might feel that he does not have the necessary skills to succeed or a working professional might not be motivated enough to do the job at hand, all these issues have their roots in the belief systems of these individuals and if these are attended to in a correct way, change will come about. Another important thing that she believes in is that people do not fail. They either ‘Succeed or Evolve‘. We all come across setbacks but as individuals we should not look at those as failures but opportunities to learn. Once we learn how to navigate these tough times we evolve and find a better way of overcoming any situation. She also shares this philosophy with all entrepreneurs as well as students whom she interacts with during her training sessions. A cause she believes in greatly is the need to create an ecosystem that encourages and supports budding women entrepreneurs to succeed in their endeavours. With this aim she has started a network initiative by the name ‘Network82‘ which is a networking event curated especially ‘for the women, by the women and of the women’. This is an initiative that is close to her heart as being a Muslim woman entrepreneur, she has gone through many challenges with very little support and guidance. She wants to share her experiences with other women to help them deal with their individual challenges better. As a parting note, the one thing that’s great about Rabab is her energy which is very infectious. She is passionate about what she does and is a fun person to be with. Her enthusiasm, great thirst for knowledge and attitude of pushing herself to become better are some of the qualities that have made her successful and will surely help her in all future endeavours.